Both Cisco ASA units must be an identical hardware model. Both Cisco units must have same ASA software image version and proper license. Starting from 8.3(1), no need for identical license. Typically, we buy license only for primary unit for Active/Standby failover, the secondary unit inherits the license when it becomes active. If we have licenses on both the units, they combine into a single running failover cluster license. Do not configure “nameif” on the failover interface. 1.Update High Availability License Key on both ASA units, otherwise ASA cannot recognize “failover” command. 2.Upgrade both ASA units to match ASA and ASDM software image version. 3.Connect a straight cable between ASAs through a dedicated failover link, in this diagram, we dedicate gigabit ethernet port 1/4 to be failover/sync link. The ASA supports Auto-MDI/MDIX on its copper Ethernet ports, so you can either use a crossover cable or a straight-through cable. If you use a straight-through cable, the interface automatically detects the cable and swaps one of the transmit/receive pairs to MDIX. Note: Standby ASA doesn’t need any configuration apart from following failover setup, because whatever you configured on ASA will be overwritten and synced from Primary ASA. Again, you do not even need to configure passwords on Standby ASA. By default, ASAs come along with “dhcp client” enabled on Gi1/1 as you see below, disable dhcp client before we proceed. If you have not seen dhcp client, just skip this step. user must manually remove or fix them as instructed before failover can be enabled. 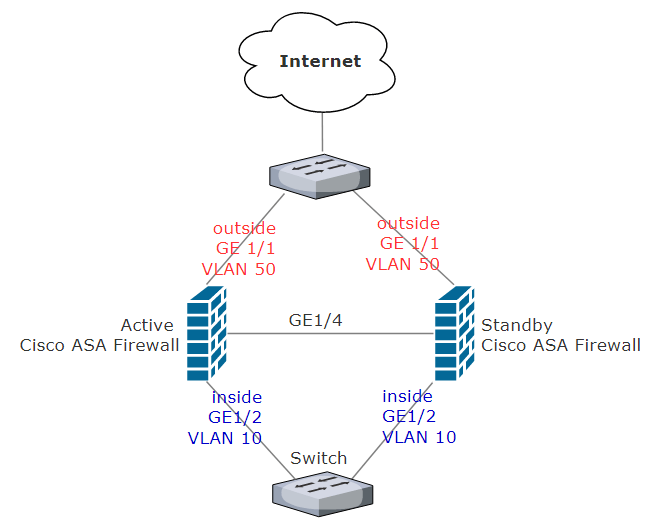 By now, all configurations are automatically copied from Primary Cisco ASA to Standby Cisco ASA. All the configuration on the Primary unit will be copied over automatically to Standby unit, as the failover is successfully configured. It is recommended that a dedicated interface must be used for the LAN Failover interface. The interface can be connected to an intermediary switch or directly with a crossover cable. Upon failover, the standby ASA (now active) swaps all interface IP addresses and mac-addresses with the previously active ASA to maintain consistency in the ARP cache. Once the devices are in the active/standby mode, changes done on the standby unit will not be replicated to the active unit. If changes are made on the standby unit, they can be discarded when you issue the “write standby” exec command on the active unit. It discards all the configuration except the failover commands on the standby unit. The terms Primary and Secondary are used only to determine the addressing provided to the firewalls. They do not define the active or standby roles. Either the primary or secondary unit can be in active or standby state.